The Kingfish's tough man Cam Brown, right, closes out a 13-year pro career tonight. In October, when Cam Brown began his 13th pro hockey season, two major factors made it different from the rest. First, he knew that his father, Blake, likely would not live through it. Second, he'd decided that this season would be his last. Yet, he said nothing on these subjects until necessary, and only to those who had to know. In that respect, Brown is like his dad, who died of cancer on Feb. 28. "I think I was considered a lot like him. He was real quiet," Brown said this week. "He was a real solid, respected and dignified gentleman. His two biggest loves in life were hockey and flying, and my brother (Ed) is a pilot and I was able to be a hockey player." Brown, 32, has been a hockey player for 783 pro games, 213 at the top of Canadian junior leagues and countless more as a kid. Now, there is just one more. With the Baton Rouge Kingfish out of playoff contention, tonight's 7:05 game against the Mississippi Sea Wolves will end his career. "It's the right time for me to leave," he said. "I just wish it was a better circumstance." Hockey players hang up the skates for many reasons. Sometimes the sport decides for them; they simply can't keep up. Others grow bitter at being denied the chances to reach their goals. Some decide the game they love feels too much like another day at the office. For Brown, it is none of the above. "Every time I step on the ice, I feel like a kid again -- honestly," he said. "At practice, at games, it takes me back to when I was ... 12 years old and still had visions of making the NHL and holding the Stanley Cup." While the feeling hasn't changed in 20 years, his body has. Once-responsive muscles balk at playing three games in three nights. His knees and back ache from old injuries. Mostly, it's his hands. If Brown's early wishes had come true, he would not have become a hockey tough guy. When he joined the Brandon Wheat Kings of Canada's junior Western Hockey League as an 18-year-old, Brown was an offensive defenseman. But he was not scoring, and he felt his job was in jeopardy. So, he changed roles. Fighting has an honored place in hockey, and players whose toughness discourages opponents from being overly physical with the skilled scorers are valuable. Brown's Brandon teammates included tough guys like Jeff Odgers, still an enforcer with NHL's Atlanta Thrashers; Kevin Cheveldayoff, now general manager of the American Hockey League's Chicago Wolves; and Barry Dreger, a long-time hockey tough guy. They taught each other. When Brown broke his right hand -- though he shoots left, Brown is right-handed -- he worked out on a punching bag with his left and kept fighting while the other hand healed. His ability to punch from both sides is a big reason he does it so well. "We all improved as fighters," Brown said. "Maybe our hockey skills suffered after that, but we started getting more recognition and noticed more by NHL scouts for our grit and our toughness." Brown led Brandon in points his last junior season in 1989-90, but scouts no longer cared. His role in the AHL, one step below the big time, was to fight. It was his only path to the National Hockey League, and he got one in NHL game as a rookie. He hoped that, as in juniors, he would be allowed to develop his game once his fighting credentials were established. It didn't happen, and when he spent 10 games with the ECHL's Columbus Chill in his second pro season, he enjoyed skating a regular shift again. Not that Brown quit fighting. 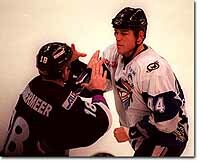 Some of his bouts were epic, such as when he and the Dayton Bombers' Jason Downey tangled during the 1993-94 season. He hit Downey in the mouth, producing two cuts at the base of Brown's right index finger that required a total of 32 stitches. Two of Downey's teeth also were embedded in Brown's hand. Told the injury would sideline him for six to eight weeks if stitched closed, Brown opted to have the wound left partially open for fluid to drain so he could keep playing. A flap of pale skin marks the spot today. "I think it was eight to 10 weeks before I could look at it and it didn't gross me out," Brown said. "Basically, it was just an open wound ... and the skin grew over the top hideously. I don't think I had any offers to be a hand model when I was done, anyway." In 1992-93, Erie Panthers coach Ron Hansis traded for Brown for the season's last 15 games. After Brown spent the next season overseas, Hansis signed him again after he broke his jaw at the end of an IHL training camp. Because higher leagues made it clear they wanted Brown only to fight, he decided he'd found his niche. Brown responded with 42 points and a career-high 341 penalty minutes. Near the end of the 1995-96 season, with the Panthers out of playoff contention, Brown fought in more than a dozen consecutive games, Hansis said. "I said, 'What are you doing?'" Hansis said. "I looked at his hands one day going out to practice. He said, 'I felt we've been a little sluggish, and I tried to get the fans going.' I almost had to tell him to shut her down a little bit." To Brown, though, it was perfectly normal. He compares it to the job he faces as team captain for this weekend. "I'm going to tell the guys, 'You're playing for your own exposure, your own pride, your own career and your own opportunity to move up at the end of the season," he said. "I said with 15 games left I'm going to make sure that my minutes are so that people will notice them. No. 2, the fans need something to be able to think about and come back to next year." The next year was the last for Erie fans. The Panthers became the Baton Rouge Kingfish in 1996-97. Had he wished, Brown might have soon fulfilled his next career dream -- coaching. But he didn't. Pierre McGuire coached the first Kingfish team, but when he took an NHL broadcasting job, he suggested that Brown, his player-assistant coach, take over. "I thought, 'I'm not ready. I'm single. I'm having fun. I'm enjoying the game.' I never really knew there was a time," Brown said. He still played well. In 1999-2000, Brown produced career highs in goals (23), assists (38) and points (61). He averaged a goal a game in the 1999 playoffs. Hansis, then the team president, offered Brown the coaching job in 1998 and 2000, but Brown said no, so Hansis signed him to a two-year playing contract. Last year, though, the East Coast Hockey League banned such deals, which allow teams to stay within the salary cap by spreading pay throughout the season. So, Brown decided this would be his last year. If the chaos off the ice -- his father's illness and changes in team ownership and coaching -- didn't confirm his decision, how he felt at midseason did. "After Christmas, it always seems to be a letdown," Brown said. "The playoffs aren't here, yet, and the January doldrums are something that never used to bother me until the last couple of years. It just hasn't felt like I brought my game at that time. I don't like not playing up to where I should be playing." It is a measure of his standards that those around him don't notice. In January, Brown had more goals (five) than any other month. It is the only month in which he averaged better than a point a game. February, however, was another story. As his father's health declined, Brown's game trailed off. He had seven points in 11 games and had a -7 plus-minus, meaning opponents scored seven more even-strength goals than the Kingfish when Brown was on the ice. Brown had known personal difficulties, including the unexpected death of a lifelong hockey friend, Chad Silver, and a devastating stroke that felled teammate and long-time friend Scott Humeniuk in 1999. But nothing in his career hit him like the situation with his father. "I'd lay down at night to think about the game and I couldn't think about the game," he said. "I couldn't have a pregame rest and concentrate on the game. It was just Dad, and Mom's situation being up there handling all that by herself. It's the first time anything's ever pierced my hockey focus, I guess. I felt I wasn't helping the team." Brown made trips home in January, when his father was conversant, and at the end. Since returning, Brown averaged a point a game entering this weekend. Until last Saturday's 5-0 loss at New Orleans eliminated the Kingfish, Brown never quit believing he'd extend his last season. "That's something Mom and Dad taught me," Brown said. "You don't ever look at the possibility of failure. If it happens, it happens, as long as you're doing your best and working your hardest." This is the aspect of Brown's career that friends and foes unanimously respect. "I think the highest compliment that you can pay a player is not the fact that he is the best player every night, because some nights they're not," said New Orleans coach Ted Sator. "But did they compete and play hard every night and play to the best of their ability? Cam Brown brings that to the table every night. That is a legacy that I think a lot of athletes would cherish." "I don't have any championship rings," he said. "I don't have any accolades to look back and put on my wall and say, 'What a great career.' I wish I had a few, but that notwithstanding, I think I can hold my head up in the hockey world with hockey people and feel good about what I've been able to accomplish." Now what? Scott Bolduc bought the team in October and fired coach David Lohrei in December, naming Dennis Maruk as interim coach. Bolduc reaffirmed this week that Maruk will not be next year's coach. "I sat down with Cam during the season and asked him what he wanted to do, and he said he wanted to play," Bolduc said. "I respect that. I told him to concentrate on this season, and we'd talk afterward. And we will." If he isn't Bolduc's choice, don't look to see him behind another bench. Brown met his wife, Brigette, here, and they have an 18-month-old daughter, Rhyan. This, he said, is home. "I'm not packing my family up and chasing the coaching career as I did the hockey playing career," he said. "As long as hockey is here I'd like to stay active in it in some respects. If it is coaching the Kingfish, I've got some definite plans and ideas on how to have a winning team and look forward to the opportunity of someday doing that if it arises. And if not, I'll be in Baton Rouge doing something else." So, it comes down to tonight -- one final game, then a step into the unknown. It's as close to going out on his own terms as he could get. "I really wish Mom and Dad were able to be down here this weekend," Brown said. "The ideal scenario would be a run into the playoffs and have them here when we finished. But just being my last game, those are my biggest fans in my whole life." "But maybe Dad is here watching," he said. Copyright © 1995-2002, The Advocate, Capital City Press, All Rights Reserved.